This is Bradley, Jonathan's husband. He asked me if I'd like to talk about what it's like living with a Star Wars fan. I can't pretend I didn't know what I was getting in to. After all, it's how we met (see 100 days to go). When Jonathan and I started dating again in 1997 he had a few Star Wars figures pinned to the wall of his flat, the odd framed poster and a small collection of other bits. 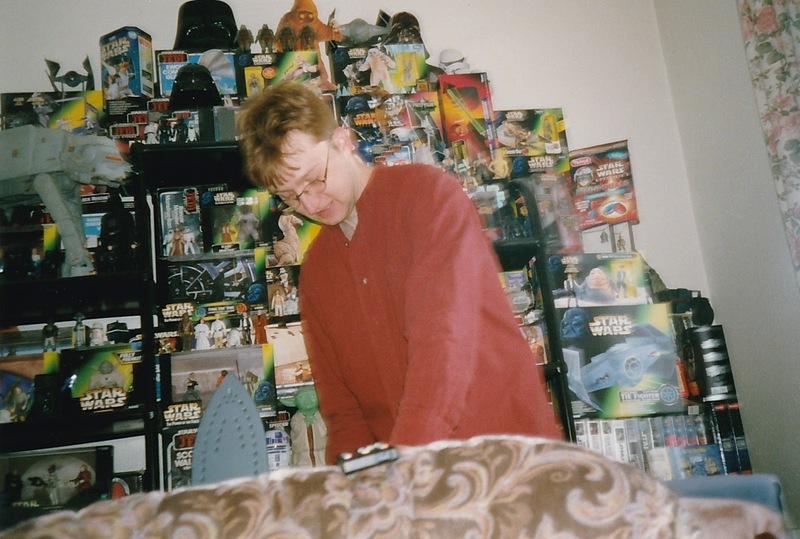 When we bought our first home together in 2000, we negotiated and the dining room became our first "Star Wars Room". Who needs a dining room anyway? Then we moved in 2007, but only on the understanding that the loft would need to be extended for... you guessed it, the new, improved "Star Wars Room". Now we are living in our dream home in Los Angeles and this time we have plenty of room for Jonathan's ever-growing collection. Or so I thought. Then Disney announced their plans for a new Star Wars movie every year! I think we only have a year or two before Jonathan starts hinting that we need more space... I'm pretty sure we'll end up living in a warehouse! Our converted loft space, 2008. Still not big enough. Jonathan's flat, circa 1998, doing the ironing in front of a rather smaller collection!